Limited edition Gravis shoes created in collaboration with the artist Slick, will be available at Island Snow. What are you doing tomorrow night? That's when 285 pairs of limited-edition Gravis shoes, made in collaboration with the artist Slick, will be made available exclusively at Island Snow, with an in-store event to take place 6 to 8 p.m. tomorrow at Ala Moana Center. 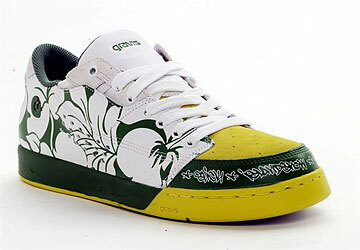 The individually numbered, limited-release shoes are the result of a long-standing relationship between Island Snow, the premium action sports lifestyle company Gravis and the Hawaii-born, L.A.-based artist Slick, who spray-painted his way from the shores of Hawaii to win worldwide recognition for his aerosol stylings. He is credited for founding a series of some of the most influential streetwear brands in the industry, and his art has been featured in documentaries, magazines, music videos, feature films and album covers, most notably "The Bizarre Ride to the Pharcyde." To launch the shoes, a special installation will be on display, with a signing by Slick and exclusive Gravis + Slick + Island Snow giveaways. Later tomorrow, the party will move to Next Door, at 34 N. Hotel St., beginning at 10 p.m. Slick will be showing original pieces of art, and partygoers will have a chance to hang with the artist and the Gravis and Island Snow crews. For more information on the event, visit www.gravisfootwear.com. 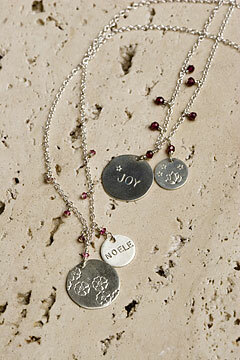 Vanilla Moon jewelry will be featured in a trunk show at Makana Mother & Baby. Makana Mother & Baby will host a jewelry trunk show featuring works by local designer (and mommy) Cathy Okinaka of Vanilla Moon. The event, taking place from 1 to 3 p.m. Saturday, will showcase a wide range of jewelry including necklaces, bracelets and earrings created with sterling silver, gold and semiprecious stones. Okinaka specializes in hand-stamped jewelry featuring the names of little ones, or any loved one, juxtaposed with symbols of flowers, stars and dragonflies. All pieces can be customized to customers' desires, with special prices offered on this day only. The event is free. Makana Mother & Baby is at 4819 Kilauea Ave., Suite 5, adjacent to Kahala Mall at the Kahala Atrium Commercial Center, just around the corner from 'Umeke Market. Look for the Territorial Savings sign on a white one-story building. Parking is available in the lot fronting the store. Riches, at Kahala Mall, will be hosting a trunk show from 6 to 9 p.m. Saturday, featuring jewelry designs by Hawaii designer Kimberly Le. Among works featured will be Le's signature Handwoven Collection, in which semiprecious stones are woven into circular forms with silver or gold-filled wire, and the designer's Chandelier Collection featuring long, flowing designs highlighted by a touch of color from semiprecious stones. Born in Vietnam to a family of artists and craftsmen, Le's jewelry features a classical, Asian-inspired aesthetic.